The opening of the summer transfer window is fast approaching so we’ll bring you all the latest transfer rumours and gossip from around the globe. 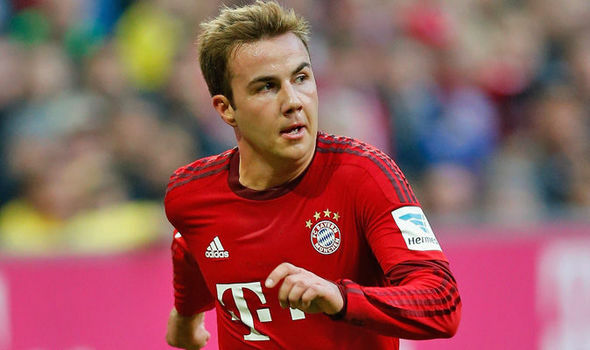 Today, Mario Gotze commits his future to Bayern Munich…. Liverpool’s hopes of completing a proposed £20m deal to sign Mario Gotze have been dashed after the attacker confirmed his desire to remain at Bayern Munich this summer, according to the Guardian. Jurgen Klopp has been busy trying to build his own squad at Anfield in recent months with Loris Karius set to join Joel Matip and Marko Grujic in moving to Anfield after the keeper reportedly arrived for his medical earlier today. The German coach was also supposedly keen on being reunited with Gotze after spending several years together at Borussia Dortmund with the Guardian claiming that Liverpool were hopeful of pulling off a cut-price £20m deal. The 23-year-old joined Bayern from Dortmund three years ago but has struggled to establish himself at the Allianz Arena and made just 11 starts in all competitions under Pep Guardiola this season. Gotze was fully expected to leave Bayern this summer in search of regular first team football and Liverpool appeared to be well positioned to secure his signature given the attackers close relationship with Klopp. However, it looks like the Merseysiders are set for disappointment as Gotze has now been quoted as saying by the Guardian that he’s looking forward to working with new boss Carlo Ancelotti next season. “I look forward to the new season in Munich and will do everything possible to be in top shape for my first training session under Carlo Ancelotti,” he said. Gotze has just one year left on his current contract so it’s going to be interesting to see whether he signs a new deal with the Bundesliga champions over the coming weeks, as you’d expect this to happen if he has in fact decided to stay at the club. Bayern would be mad to allow him to enter the final 12 months of his contract as they’d run the risk of losing a valuable asset for nothing next summer, so there could still be hope for Liverpool if there are complications in any negotiations over an extension. The situation has been further complicated by the news that Gotze has parted company with his long-term agents Sports Total, so there is a theory flying around that the German international’s statement could be designed to put pressure on Bayern to make a quick decision over his future. By committing to the club, Gotze has put the ball in Bayern’s court to either offer him a new deal and the promise of a fresh start under Ancelotti, or sell him now rather than lose him for nothing in 12 months time. I certainly don’t think this is the last we’ll hear on the future of Gotze and there could be a few twists and turns yet, so Liverpool may not have given up hope of luring him to Anfield just yet.